Admission is free, but RSVP is required, please clicking on Sign Up above the picture. U.S. Ambassador to the Czechoslovakia William Luers (1983-1986) and his wife Wendy. Join us for a special discussion with former U.S. 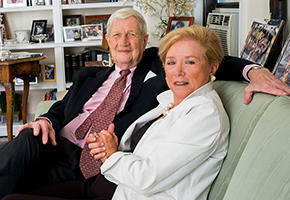 Ambassador to the Czechoslovakia William Luers (1983-1986) and his wife Wendy on their work at the U.S. Embassy in the 1980s, their return to Prague in the 1990s, and their endless love for the Czech Republic. What was it like to be the U.S. Ambassador to communist Czechoslovakia in the 1980s? How did the U.S. Embassy support Czech dissidents, such as Václav Havel? How did the U.S. Embassy help create the Czech non-profit sector after the Velvet Revolution? The program is in cooperation with the VIA Foundation. The program will be in English.